Three Republican senators are accusing the Obama administration of compromising intelligence gathering by holding Abu Anas al Libi on a Navy ship instead of sending him to the U.S. military base at Guantanamo Bay. During a press conference Tuesday, Republican Sens. Kelly Ayotte of New Hampshire, Saxby Chambliss of Georgia, and Lindsey Graham of South Carolina called the detainment of al Libi on a Navy vessel in the Mediterranean Sea a "huge mistake." Graham commended the administration's use of "boots on the ground to capture people" as a "good change in policy," but said there are "fatal flaws" in the U.S. intelligence gathering system. "It's hard to interrogate a dead man," he said, so it's good that the administration is no longer "killing everybody by drones." 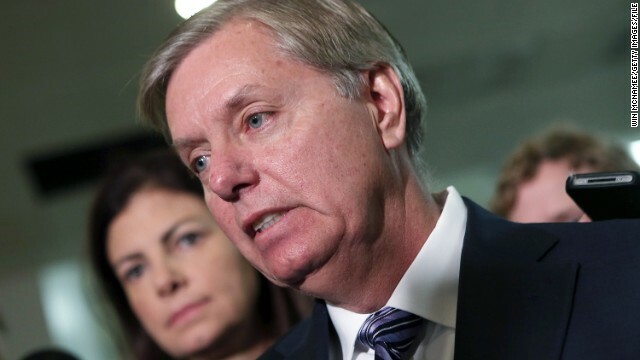 But the refusal to send al Libi to Gitmo and to hold him instead at sea is "not a proper way to gather intelligence in the war on terror," Graham added. "We know that al Libi has had at least two decades of al Qaeda experience at the highest levels," said Ayotte, who called al Libi a "potential intelligence goldmine." Al Libi is accused of playing a key role in the 1998 twin bombings in Kenya and Tanzania that killed 224 people, including 12 Americans, and of working with Osama bin Laden directly beginning in the early 1990s. As an intermediary with Aymin al Zawahiri, he played a "critical role" in establishing al Qaeda in Libya. Al Libi was indicted in absentia by a federal court in New York's Southern District for his involvement in the Dar es Salaam, Tanzania and Nairobi, Kenya bombings. Chambliss said he recognizes that al Libi has been indicted and said he ultimately "ought to be tried" in a civilian court, but information relative to current al Qaeda and al Qaeda affiliates will be lost without a long-term detention policy. "Let's make no mistake about it. This is the highest value target we have captured in years," he said. Under current rules of war, al Libi can only be held in military custody aboard the USS San Antonio for a certain period of time before he is transferred to federal law enforcement officials in the United States. In 2011 the U.S. detained Ahmed Abdulkadir Warsame aboard the USS Boxer for two months before he was given a Miranda warning and flown to New York, where he was indicted. The senators say this framework doesn't give interrogators in the intelligence community enough time to tap into the al Libi "goldmine." "This system of using Navy vessels, Navy warships, in lieu of Gitmo compromises our ability to gather intelligence," Graham said. Aw what's the matter...you afraid he will tell all about WHO was funding their pow-wow's? Better get out now and fast! We've heard this before. If Obama and the justice department put him in Gitmo , then the right wing crowd would say" why dont you try him in civilian court". The truth is there is a much better chance of prosecution in the civilian court. Once they go to Gitmo, they are detained indefinitely without trial.. Its hard to try some one you just finished torturing, that's why there are s many Bush detainees. It's Congress that should be put in Gitmo..starting with these 3 idiots! You nailed it, Nathan. Thank you. Gitmo is and has been nothing but a national disgrace from the beginning and now these right-wing nut jobs want to put another man there so that he will have to endure the same tortures that other political prisoners did is truly disgusting! Enough is enough! It amazes me how stupid people really are....Bush is the one that started the phone thing, not obama...Get your crap straight ...it makes you look like an idiot. and a paid writer for the GOP/TEAPARTY. I can understand why Gitmo was not chosen as the destination for this guy. Gitmo was misused and left a very nasty taste. The sooner we can possible close this facility the better. However, when a foreign terrorist (who has harmed the US) is captured alive should NOT be afforded all the "rights" in our civilian courts! Read him his Miranda Rights??? What right does he have to this law? He is NOT a citizen! Our laws require that defendants in civil courts be afforded legal representation AND that the jury in his trial be a jury of his peers! Does this mean we need to import terrorist lawyers to represent him AND import terrorists to sit on his jury? Just doesn't work under our current system! Hopefully, our interrogators will get what information Al Libi may have while at sea. Once he enters our civil justice system (designed for our citizens) and gets lawyered up, nothing more will be obtained. The Navy should then conduct a "man overboard" drill without success! Oops, he fell overboard! The pirates called this "walking the plank"! Any ship at sea (military or civilian) is governed by the ship's captain. The captain is both judge and jury! So be it! When you say terrorist do you mean arab? The gov should worry about the economy and not the phoney wars on drugs terror. Every Arab they parade around you think is a terrorist THESE ARE HUMAN BEING let me ask you 2.5 million people were murdered in Iraq & Afghanistan were they all terrorists? with the ship; when did HE become an expert on interrogational geography and timing? His little group needs to shut up and let the pros do their job. This Republican pomposity knows no limits. GOP has lost the fight & the war, they will lose the House AND the Senate because they closed down the Govt., they let a group of EXTREME, TeaParty people hurt America as they were TRYING once again to hurt ObamaCare (OBAMA)! This is the part of the party that does not even beleive in science, and hangs on M. Bauchman's every word! It's not your proud parents GOP anymore folks, that's for damn sure, not the party was I born into (3rd generation TX). I was a republican for over 34 years, now Independent, I ran from the GOP in 2008 – Too many TeaParty Loony-Tunes! Thank you, RettasVegas. You nailed it! The Tea Partiers really took over that party. Ironically, the GOP was founded by Abe Lincoln and a group of flaming liberals in 1854 who wanted to abolish slavery and Pres. Theodore Roosevelt also belonged to it until he founded the Bull Moose Party in 1912. Now it has become the party of right-wing fanatics who in no way are fit to hold office! If you milk the cow till it dries up what have you gained? Go get your Obama phone, Obama healthcare, Obama welfare, Obama food stamps, and at the end of the day you will have nothing. Eventually stupid people like me that go to work are going to get feed up and cut off the leaches. We all want the same thing a wounderfull country but some of us are smart enough to know it has to be earned not given. Get your facts straight.. It sounds like you're a paid writer for the TEAPARTY/GOP. Obama didn't start the phone thing that was your beloved BUSH. CRAZY. NANOTECHNOLOGY TO MANIPULATE HUMANS WITH BIOLOGICAL VOLTAIC TENSION. DENOUNCE: MASIVE ASESINATION WITH NANO TECHENOLOGY IN DRUGS USE. REMEMEBER THE SPEECH TO HUGO CHAVEZ FRIAZ. WE HAVE VENEZUELANS !!!!!!!!! INTERVENED !!!!!!!!!!! UNTIL THE TUETANOS (ESPINAL). People like these right-wing Senators John McCain and Lindsey Graham are the biggest single threat this country faces today! It will be these people who'll eventually bring this country to it's very knees along with the ignoramuses who vote for them! As far as this country is concerned, ignorance is definitely not bliss, but poison!!! I served 1091 days, and I say the same to you. Post your discharge papers.